Messy play activities - you either love them or hate them! Many parents prefer to leave the messy activities to kindy or pre-school, but try outside on sunny day and you quickly realise that any mess can usually be fairly quickly tidied up again. Even better, arm the kids with buckets of warm soapy water and make tidying up after part of the activity! 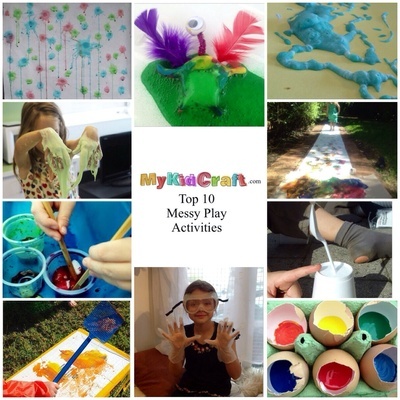 Here's our Top 10 messy play ideas from the MyKidCraft archive for some inspiration. Grab some chopsticks and give Carly's cotton ball dunking a try. Ready, steady, fire! Check out MonSta's catapult cups. Make your own erupting aliens using bicarb and vinegar. We love Carly's fly swatter painting for some messy fun. Create a great gift with Lindsay Law's awesome bath bombs. A great large scale outdoor activity on a summer day, try Jane's messy footprint runway. Get stuck in with Natasha's homemade borax-free slime. Many North American slime recipes contain borax which is hard to find in UK or Australia so this is a great alternative. Recycle some egg shells and get splatting with Claire's paint filled egg splat activity. Perfect for a rainy day, check out Janine's microwave puffy paint recipe. This one is definitely an outdoor activity! We love tennis ball painting. Check out loads of other great messy play activities here. Got a messy play activity idea? Why not become a writer and share with the MyKidCraft community? Click on 'Write for us' to get started.